Ruth Schmuff Hand-painted Needlepoint Canvas. 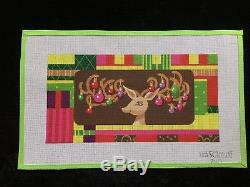 Bright and colorful design titled "Christmas Reindeer Collage". This was the Holiday Mystery Class at Bedecked and Bedazzled in 2015. Includes stitch guide done in sections, and all threads and beads as shown in the second photo. Canvas size is approximately 20 1/4 x 12 1/2 inches. Design size is approximately 15 1/2 x 8 inches. It has all lived in a smoke-free environment. 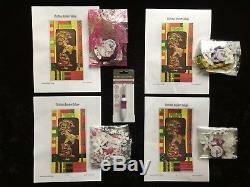 The item "Ruth Schmuff Hand-painted Needlepoint Canvas Christmas Reindeer Collage/SG/More" is in sale since Thursday, December 13, 2018. This item is in the category "Crafts\Needlecrafts & Yarn\Embroidery & Cross Stitch\Hand Embroidery Cloth & Canvas\Plastic Canvas". The seller is "chloeandcoco" and is located in Smyrna, Georgia.